On arrival at the airport our representative will meet you at the airport arrival lounge, and will provide you transfer to the hotel. 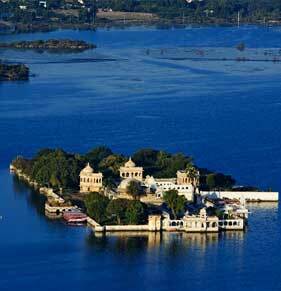 the 350-year-old walled city was built by Emperor Shah Jehan in 1648 as his capital. Opposite the fort are the black and white onion dome and minarets of the Jama Masjid, the most elegant mosque in India. Raj Ghat is worth a visit where Mahatma Gandhi was cremated in 1948.
the new capital designed by Sir Edward Lutyens. An interesting drive in the one passing through the impressive Rajpath from the World War I memorial arch, the India Gate towards the Presidential Palace. Visit Humayun's Tomb built in 1565 AD, Safdarjung's Tomb, the Qutub Minar, 72 meters high and the most curious antique, the uncorroded Iron Pillar, which dates back to the 4th century AD. In the evening return to the hotel. Morning after breakfast drive to Mandawa, on arrival check in at the hotel, on arrival check in at the hotel, In the afternoon visit Fort and Havelies. Mandawa lies in the heart of Shekhawati region of Rajasthan, India and is basically a municipal town of the Jhunjhunu district. Mandawa is also known as Rajasthan's 'open art gallery', as the entire region is adorned with artistically painted havelis, mansions and homes. Some of the popular havelis that have become important tourist destinations are the Ladia haveli, the Chokhan haveli, the Binsidhar haveli, the Gulab Rai haveli and the Newatia haveli. Morning after breakfast drive to Bikaner, on arrival check in at the hotel. In the afternoon visit Junagarh fort, Lalgarh Palace, Mata Karni Temple. Bikaner lies north of Jodhpur, its reddish-pink stone rising out of miles of barren thorn and scrub. Rao Jodha's sixth son, Bika (after whom the city of Bikaner is named), must have found nothing more than this wilderness when he rode out here in search of greener pastures to conquer, but he was obviously undeterred. 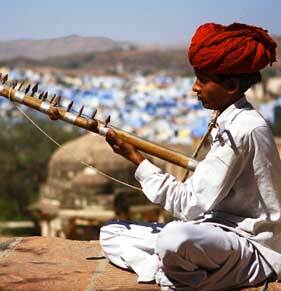 The Rathore clansmen set out from Mandore the same year that his father shifted his capital to Jodhpur. Taking with him three hundred zealous retainers, they massacred the first opposing clan they encountered. Next they came in touch with a branch of the Bhattis of Jaisalmer who had settled in the region, and Bika married one of the daughters of the chief. Using this settlement as a base he was able to extend his sway over the entire region. Having secured the submission of the Bhattis, and later of the Jats in the region, he founded his capital Bikaner here. After breakfast, drive to Jaisalmer. 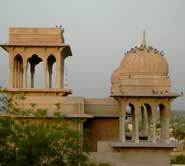 Arrive Jaisalmer in the evening and transfer to hotel. 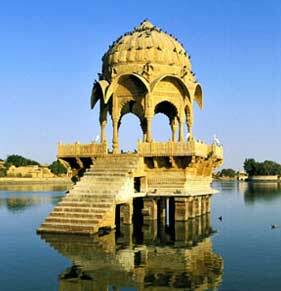 Jaisalmer, another princely state of Rajasthan is a paradise of the desert kingdom. 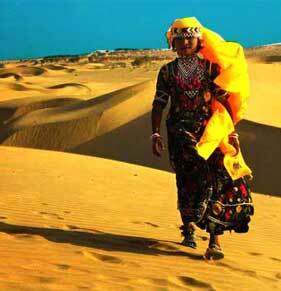 Summarizing the allure of the desert, the splendid Jaisalmer nestles in the foothills of Trikuta. 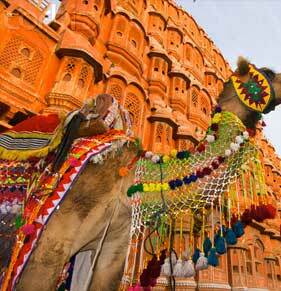 Jaisalmer is a desert city and instantly invokes number of images in the mind of travellers. 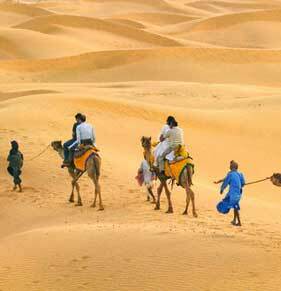 The word itself provokes an image of deserted land with camel swiftly moving on the golden sands. The city is almost enticing and for domestic travellers as it is to foreign tourists. Standing in pride with its colossal forts, palaces and havelis, Jaisalmer showcases the artistic sense of the Rajput kings. The city is awesome to cover in cool season. Th city is actually divided into nearly two equal halves. The town is smal enough to be covered on foot. If not less, try spending atleast 4 days in the city, only then you would get a full coverage of beautiful city. Morning after breakfast we start the first day camel safari to Badabagh. On arrival visit Badabagh. In the vicinity itself you will find Govardhan Stambh (pillar). This pillar was constructed to commemorate the construction of the Dam and the tank. In the local dialect the Dam and the tank are known as Jait Bandh and the Jait Sar respectively. 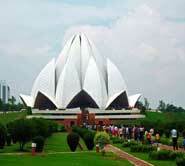 It is believed that these are based on the name of the man who constructed them. The Jait Bandh is a dominating structure. It is about 1,200 feet in length and 350 feet in width. If you observe it closely you will notice that this has been built out of solid blocks of stone. The same material has been used for the construction of well as well as the tank. Morning after breakfast proceed for Ludharva via Roopsi, a mixed cast village with mud and stick houses. Later visit Jain temple & proceed to Chatrayil, a traditional and typical muslim village. 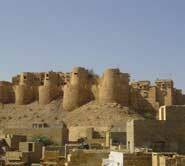 Lodharva was once the capital of the Bhatti Rajputs of Jaisalmer who ruled over these lands. Today nothing else but the ruins remain still testifying the glorious eras gone by. Situated in the heart of those ruins are the ancient temples, which are a great attraction for the tourists visiting the place. The Lodharva temples are best visited for the fine architecture and detailing. The Jain Temple housed here, dedicated to the 23rd Jain tirthankar, Parasnath, attract the most number of visitors. The Kalpataru tree is also a must visit site in this complex. Morning after breakfast start the journey for Salkha, a traditional Rajput village. Later visit Sand dunes. Morning after breakfast proceed to Masoordi via Kanoi, a typical carpenters village. Later proceed to Jeseiri, a water tank surroundings by Oasis and beautiful landscape. Morning proceed to Deegasar via Dedha, a Rajput village and the life style of Rajputs. Deegasar is a place which is surrounded with beautiful landscape and a small lake. Later proceed for Kuldhara via a small Rajput Dhani, a typical group of houses where people stay while cultivating their agriculture fields. Arrive Kuldhara and overnight in tent. Morning proceed for Jaisalmer visiting Moolsagar and Amarsagar. On arrival at Jaisalmer check in at the hotel. Rest of the day free at leisure. Overnight stay at hotel. After breakfast, city sightseeing tour, visit Jaisalmer Fort, Jain Temple, Patwon ki Haweli, Salim Singh ki Haveli and Nathmal ki Haveli evening visit for Sand Dunes, enjoy culture programme & camel safari. In the evening return to the hotel for overnight stay. After breakfast, drive to Jodhpur. Arrive Jodhpur, on arrival transfer to hotel. Overnight stay in hotel. 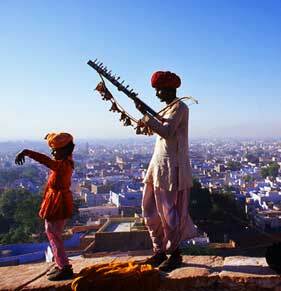 Located on the periphery of the Thar Desert, Jodhpur is second largest city in Rajasthan after Jaipur. According to one fable when Lord Rama, hero of the Hindu epic Ramayana wanted to cross the ocean to rescue his wife Sita, who had been abducted by the demon-king Ravana, he was turned back by the Sea-God. Furious, Rama mounted his arrow to dry up the ocean forcing the Lord of the Sea to retreat. However the arrow once mounted had to be discharged, and Rama fired it into another body of water located in western Rajasthan, thus drying it up. This is the area known as Marwar or Marusthali or the land of the dead. Morning sightseeing tour of Jodhpur including The Mehrangarh Fort situated at an altitude of about 125 metres is spread over an area of 5 sq. km and has seven gates. The Jaswant Thada is a white marble memorial built in memory of Maharaja Jaswant II in 1899. 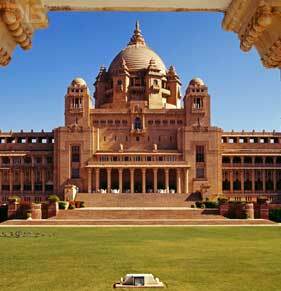 The Umaid Bhawan is a majestic building that presently functions as a hotel and museum. 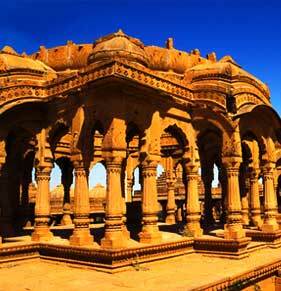 The Mandore Gardens, situated about 8 km from Jodhpur, has cenotaphs of the Jodhpur rulers. The Government Museum and Zoo are located in the pleasant Umaid Gardens. Morning after breakfast drive to Jaipur. On arrival at Jaipur check in at the hotel. Rest of the day free for leisure. Overnight staty at hotel. Morning after breakfast an excursion tour to Amber Fort, situated just outside the city, ascend fort on Elephants back. In the afternoon sightseeing tour of Jaipur including, City Palace in the heart of Jaipur is known for its blend of Rajasthani and Mughal architecture, Jantar Mantar, is the largest of the five observatories built by Sawai Jai Singh. The Hawa Mahal or the Palace of Winds. Overnight stay at hotel. Departurev Morning after breakfast drive to Delhi, on arrival transfer to the international airport to board the flight for onward destination.